The Air Force has activated a new recruiting squadron at Joint Base San Antonio-Lackland’s Medina Annex in Texas, focused on sourcing candidates for its special operations career fields. For the first time, a unit — dubbed the 330th Recruiting Squadron — will be solely dedicated to recruiting for the Air Force’s ground-based combat jobs, known as battlefield airmen, and which include the pararescue, combat control, special operations weather and tactical air control party careers. The recruiting squadron, activated June 29, is being introduced alongside a new nine-week battlefield airmen preparatory course designed to better condition airmen before thrusting them into grueling, two-year training programs with attrition rates that traditionally exceed 75 percent. “The driving force behind this change is a need for more operators,” Air Force Recruiting Service spokeswoman Capt. Erin Ranaweera told Air Force Times. The Air Force’s battlefield airmen are in high demand around the world. Their footprints dot across the Middle East, Africa, and Southeast Asia, where the different careers perform combat search and rescue, assault zone and airfield reconnaissance, and even close air support for other special operations forces. And that high operations tempo isn’t expected to go away anytime soon. The multiple pipelines to train Air Force special operators vary in length. Combat control or pararescue airmen, for instance, typically take more than two years to train up and push out to a team. During those pipelines, which include training in combat diving, high altitude parachuting, combat medicine, air traffic control and survival, the teams bleed off the bulk of their candidates to self-elimination, injuries and performance failures. The other services’ special operations units already have separate recruiting programs to address their high failure rates, according to Col. Claude Tudor Jr., 24th Special Operations Wing commander. The new approach marries a stricter evaluation of candidates prior to their arrival at Air Force basic training with a greater focus on mental resilience and physical strength before officially starting the pipeline. Chief Master Sgt. Joshua Smith, a 25-year veteran of pararescue, serves as the superintendent of the new preparatory course, which began a pilot program a year ago and has completed six classes of about 100 students per class. The individual careers have different attrition rates, but since the course was introduced, injuries have decreased by 30 percent and the production rate increased from 35 percent to roughly 57 percent for battlefield airmen as a whole. “We created a course asking ourselves: if it was your little brother, sister, son, daughter, whatever, what would you do to prepare them for the pipeline?” he added. Water confidence, in particular, has a steep learning curve. 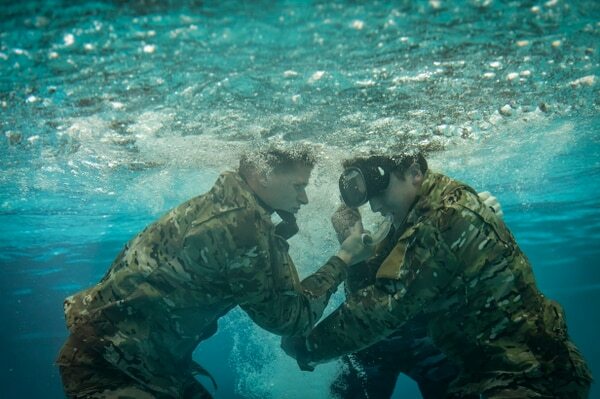 Underwater challenges like “buddy breathing” and “drown proofing” are difficult and dangerous for recruits to practice alone. 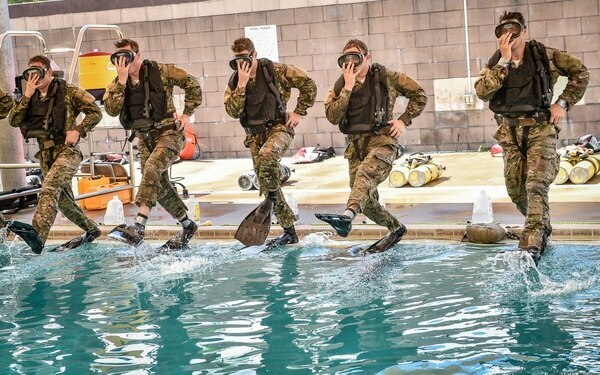 Rather than dumping candidates into the pool to perform breath-holding tasks with instructors harassing them straight out of basic, airmen are eased into the process and taught more about their personal limits. Additionally, during the first week of the prep course, trainees receive a baseline testing of their functional movement, body composition, and even blood work. 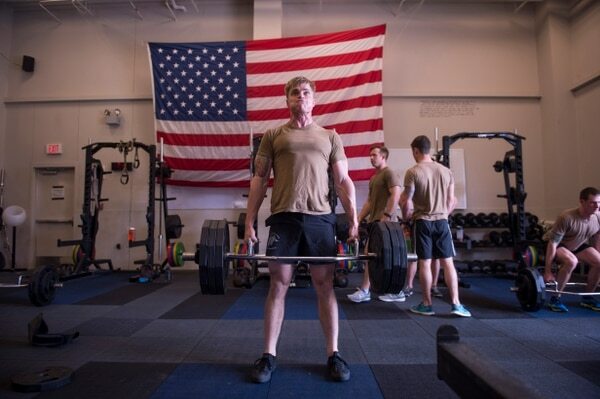 As the course proceeds, they split their time between classes on how to build rucks, nutritional science and other life skills, and working out. Throughout the course, character attributes of students are also logged. “If we see a kid lacking professionalism or integrity, we can log that in a database. Over time, that creates a map of their personality,” Smith said. Teammates also do peer reviews of one another, which is similarly added to the database. If a student fails a test or requires counseling, those personality maps can be referenced by instructors to make a decision on whether they should proceed. Although the battlefield airmen career fields are now open to women, none have completed a program so far. Something that is unique about the program: the battlefield airmen careers have one of the few — possibly the only — gender neutral training facilities in the Department of Defense, according to Smith. “All of our students sleep in the same quarters and use the same latrines, no matter what their gender is,” he said. On top of the preparatory course, the new recruiting squadron will be comprised of 96 recruiters operating in strategic locations across the country, as well as field developers — civilian contractors who previously served as special operators. Recruits who have potential will work with developers before shipping out to basic training. Rather than simply passing the entry-level standards of the Physical Ability and Stamina Test for their respective career field, recruits are evaluated more closely by the contractors, who must sign off before allowing a candidate to proceed. The end result is a more thoroughly vetted trainee than what existed five years ago. 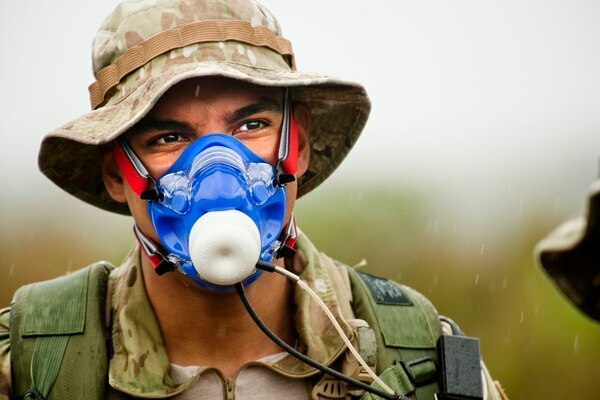 Poorly prepared trainees usually wither away in Air Force basic training, which isn’t built to sustain the physical activity levels an operator requires. Furthermore, the developers have been known to “create tight bonds with the students they send,” Smith said. On top of the developers, the new 330th Recruiting Squadron serves to grab more public attention through social media, recruiting videos, and arranging for operators to make appearances at triathlons or civilian obstacle course events, like Spartan Races. “We are now sending forward the most viable candidate in probably 15 to 20 years, if not ever in history,” Smith said. He added that the Air Force wants the battlefield airmen careers to hit a 70 percent production rate by 2020, reflecting the ever-growing need for the uniquely capable airmen.